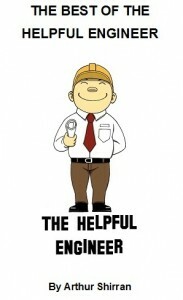 The Helpful Engineer e-book is now available to buy at a very competitive price. You can click the links below to purchase it. It contains a large selection of articles from the website. So if you are looking for a last minute socking filler for Christmas or a treat for yourself, feel free to buy it and let me know what you think, or even better review the book on the Amazon website. If you purchase the book it will be downloaded for free immediately to any Kindle reader, laptop, android phone, iPad, iPhone, PC or tablet. For American and Irish readers click Amazon.com, price $3.51. For British readers click Amazon.co.uk. You can also buy it on the other Amazon language sites, click any of the following languages to be directed to the relevant Amazon site: French, German, Italian or Spanish. It is priced at €2.99 or $3.51. Happy Christmas.